"...anxiety over Greece rose in financial markets, driving Greek bond yields up to 7.25 per cent, closing on Hungary, a non-eurozone state bailed out by the EU and the IMF in 2008. Greek yields have risen by more than one percentage point this week and by three percentage points since October. George Papandreou, Greece’s prime minister, blamed “malicious forces” for stories about Athens seeking funds from China and elsewhere, which helped trigger the turmoil... investors warned they might shun Greek debt, accusing Greek ministers and bankers of mishandling the bond issue, which left some funds nursing heavy losses." Luckily for the Greeks, the EU will not let them fail, and is reportedly putting together a bail-out. Unluckily for the Greeks, the EU (aka the Germans and the French) will insist on huge and immediate spending cuts and tax increases. 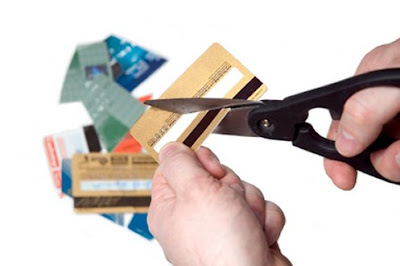 The Greek government has lost control of the situation, and Greece may well be made an example of, specifically to encourage other debtor nations like Portugal and Spain. "If Greece goes under that's a problem for the eurozone. If Spain goes under it's a disaster." "Spanish public debt (52pc of GDP) is 20pc lower than Europe's average; our treasury spends 5pc of revenues on debt costs, less than France and Germany." Because on that basis, Spain looks like a paragon of fiscal virtue not just compared to Greece, but also compared to us here in the UK. Now, it is true that Portugal, Italy, and Greece are all currently worse than us in terms of debt outstanding, but we're catching up fast (see yesterday's blog on the Ring of Fire). 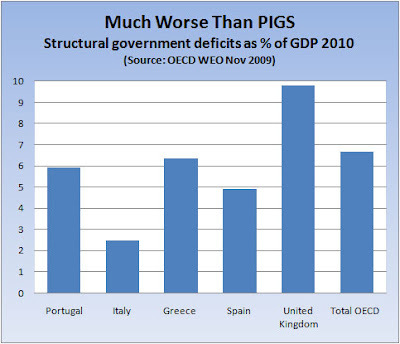 And as Zapatero says, Spain's outstanding debt is actually lower than other countries, including us. According to the OECD, Spain's gross government debt is currently 67% of GDP (2010), whereas ours is 83% (remembering of course that this is just our official debt, excluding all the off-balance sheet Enron items). And Zapatero also points to the importance of the debt interest burden - how much of the government's revenue has to go on paying interest costs. In Spain's case it's a relatively comfortable 5%, and that was roughly where we were before the bubble burst. 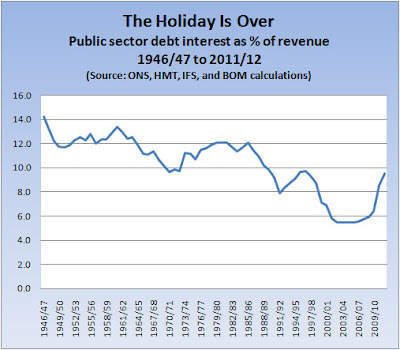 Unfortunately, our debt interest burden is now escalating wildly. According to the Pre-Budget Report, it will reach 8.6% in 2010-11, and the IFS estimates it will reach 9.5% the following year. Make no mistake, this is a turnaround of historic proportions. For four whole decades following WW2, British taxpayers struggled under the burden of the War's massive cost. An average 12% of our taxes - one pound in every eight - went not on providing public services, but simply on paying debt interest. And right now, we are headed straight back to where we started. And this time, in a world of globalised PIMCO markets, and no exchange controls, we are going to find that the consequences in terms of HMG's borrowing costs are much worse than they were in the 40s and 50s. Which is why it is absolutely vital that whoever is Chancellor after the election doesn't duck the need for big spending cuts in the summer budget. As the FT reports, the interest rate on Greek debt has jumped 1% in a week, and is up 3% in the last three months. If the new Chancellor fails to grip the problem at the first attempt, that could easily happen to us - or much worse. PS Global beer giant SABMiller is joining the corporate stampede from the UK. Their CEO says: "One of the things that attracted SAB Miller to move its HQ to London and to list on the LSE in 1999 was the liberal and predictable tax regime. That's no longer the case. Today the tax system is not predictable and there have been numerous increases, particularly when it comes to personal taxation. This means that as a global company we are no longer able to attract our best global talent to the UK. Why would someone move from Hong Kong where the marginal tax rate is 15 per cent and come to the UK where it is closer to 52 per cent. Taxation was a key part of our decision to locate a new global procurement business not in the UK but in Zug in Switzerland." That ticking noise is getting a lot louder.